I used to think that Estee Lauder was for older women, so I never paid a lot of attention to their products over the years other than the occasional nail polish. Ever since Tom Pecheux was named as Estee Lauder's Creative Makeup Director, I've taken much more interest in their color cosmetics. He has given their line some fabulous new creations, and I'm following and using this line more than ever now. The fact that I am also an older woman now, may have something to do with it too! One of my favorite discoveries of Mr. Pecheux's was his Pure Color Illuminating Powder Gelee, which sold out shortly after it was released. I adore this product, so I knew when he incorporated that same type of formula into the recently released Pure Color Gelee Powder Eye Shadows, my obsession with Estee Lauder would be unstoppable. Carson Pirie Scott was having their Buy More Get More Beauty sale yesterday, so I took advantage of discounts which are seldom available at the make up counter and picked up the last of the "Cyber Eyes" shadows needed to complete my collection. As I was checking out, there were some mysterious red boxes behind the counter, and when you tie my favorite bag guy, Michael Kors into my Estee Lauder obsession equation, I'm in big trouble! 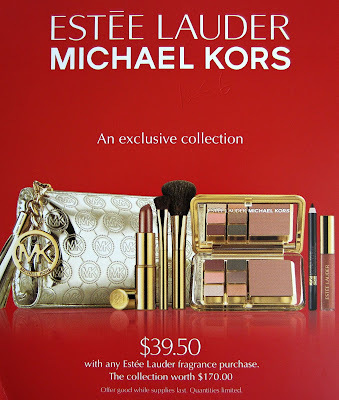 The Estee Lauder counter girl (my enabler) kindly showed me what was in those boxes, and if you're a Michael Kors fan, you'll want to grab one of these before they're gone. The photos I'm showing you are photos I took of the promo card, and the products are even more stunning in real life. This exclusive collection will be available at Carson Pirie Scott beginning tomorrow, and will be available only while supplies last. I don't know if it will be available at other Estee Lauder counters. It's priced at $39.50 with any Estee Lauder fragrance purchase. Last year Estee Lauder had a similar Coach promotion, which sold out very quickly. I was able to open a set up and look at it, and the eye shadow range is right up my alley. The olive green shade is so pretty! You don't know how badly I wanted to bring this home with me today, but I'll have to wait until tomorrow to pick it up when the promotion begins. My enabler is going to ring it up first thing in the morning for me, so I know I have it before it sells out! They have been coming out with some really neat products lately, but I wish they would change the scent of their lipsticks! I wonder if those Michael Kors set will be available around my area. I hope so! There are many fragrances from Estee Lauder than I like. There are some like Estee that seem very heavy & old ladyish. I don't like that at all. Beautiful smells lovely. They've really changed their makeup & fragrances to be more youthful. Gotta have it! I imagine it will be at Nordstrom since the Coach one was. Boy, I hope so!! Seneca~I'm impressed with a lot of their recent products too. I've not tried their lip sticks yet, so I'll give them a sniff! I am looking forward to trying their glosses though and hope they smell alright. More of a gloss than a lip stick fan. Lucy~I now think they will be available at all counter because I received an eMail from the EL mailing list this morning showing this set with the same info that was on my card. I know it's also available on their site. Polarbelle~I know, that's how I felt too! HAD to get it! And yes, I do think Nordstrom will carry it.